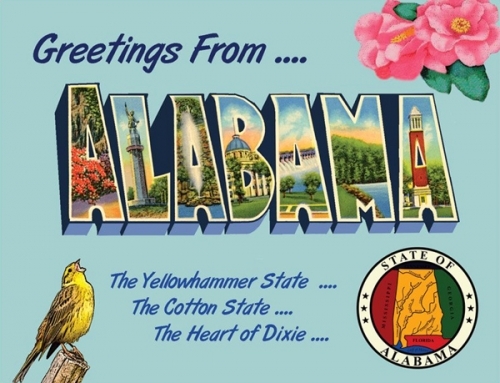 Greetings From Alabama Postcard - Custom original only available at Legends' General Store. Text on back: Alabama, Alabama, We will aye be true to thee ... Unofficially nicknamed the Yellowhammer State, after the state bird, Alabama is also known as the Heart of Dixie and the Cotton State. Alabama became the 22nd state of the Union on December 14, 1819. Its tree is the Longleaf Pine, the state flower is the Camellia. The capital of Alabama is Montgomery. Custom, new.